Welcome to another week of the best freebies and deals available to us this week. My list includes samples, coupons and more.Only sign up for those offers you feel comfortable with. Always try to use a separate email account for freebies, to keep from clogging your primary account. Thanks and have fun getting some great stuff today! Disclosure: Some of the samples are provided through referral and affiliate links. I may receive small compensation for them. Eversave Ice Cream Social Save plus $5 in Save Rewards towards ANY deal on their site! Go here to enter. Winner Announce May 22nd! Working Mother Magazine one Year subscription. Go here to enter. Winner Announced 5/22. All You Magazine Daily Samples here. Check the "MOST RECENT SAMPLES" widget at the bottom for all of the week's samples. Ongoing: Join Pampers Gifts to Grow now and get 100 Free Points here. Also, join their Parent Safety Panel for other freebies here. Couponing ebook from Double Saving Divas (Extreme Couponers!) here. One year subscription to Garden Design (digital) and other magazine offers at ValueMags here. Ongoing: Subscription to American Baby Magazine here. Ongoing: Personalized Online Printable Cookbook from Midwest Living here. You add your own recipes! Ongoing: Kindle ebooks (Read on your computer and other mobile devices) here in the right column. 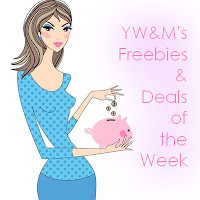 $0.35 off Yoplait Greek yogurt from MyBlogSpark here. Walmart coupons (for in-store use) here. Target coupons (for in-store and online) here. $10 shipped for 500 Premium Business cards from Vistaprint here (includes shipping plus uploads! $10 off $10 at MyHabit.com with no minimum purchase required using coupon code 'MYHABIT1'. Free shipping on all orders. Keep an eye out for possible freebies with this.